You are here: Home / What are the Best Neighborhoods in Cary, NC? What are the best neighborhoods in Cary NC? My clients priorities tend to be the best schools and a family focused community with amenities including a pool. I’m giving you a list of the 12 best neighborhoods in Cary and then will go into more detail about each. All of these neighborhoods have good schools and a neighborhood pool. I have to put Preston on the list even though it doesn’t have a neighborhood pool but instead a Country Club. Preston was developed around the Prestonwood Country Club with estate homes. The developer developed the area around the estates for more affordable homes (compared to the estate homes). Sections of the development were sold off to different builders. Each of these neighborhoods have Preston in the name. Because the builders were different the quality can vary. Also, some of the homes in the Preston neighborhoods have been beautifully updated. The lots are almost all pretty. My clients often fall in love with Preston Village and decide that is where they want to live. In the end they don’t always buy there because the floor plans are typical 90’s and many need updating. The good ones are also sold in about 5 minutes so it’s hard to compete with multiple offers. Preston Village is one of of the Preston group of neighborhoods developed in the area around the Prestonwood Country Club. What makes this neighborhood special is it has a ​neighborhood pool ​and huge playground included with the HOA dues of $161 quarter. No need to join the Prestonwood Country Club. It’s walking distance to the highly rated Green Hope Elementary, Green Hope High​ and the Cary Tennis Park. It’s also just a mile or so walk to shopping, retail restaurants and a big Asian grocery store. Homes are priced in the $600,000-$800,000 range. The first planned neighborhood in West Cary. 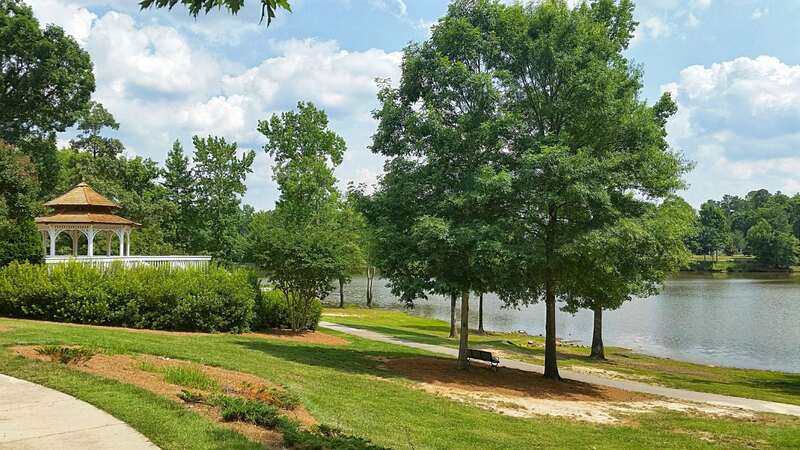 The neighborhood pool, homes, townhomes and condos in different price ranges, walkable to retail and restaurants, lake and greenways make Cary Park a true outdoor living neighborhood. The pool is open to outside neighborhoods for membership. For more info read my Cary Park page. Watch a neighborhood video about Highcroft. This neighborhood is a real favorite! With Highcroft Elementary School in the neighborhood, adjacent to Sears Farm Park, a neighborhood pool and homes in a popular price range you’ll have to act fast! The best custom builders built homes in Copperleaf. The lot sizes are around 1/2 acre which is considered huge in a newer home. There is a neighborhood pool and the development is adjacent to The American Tobacco Trail. There are some new homes across from Copperleaf in Copperleaf Reserve. The lots aren’t quite as big and there isn’t as much variety because there are only a couple of builders. This house in The Reserve has been updated. I love this neighborhood because it has a great location, 1/3 to 1/2 acre lots, pool, walking to Sears Farm Park and Highcroft Elementary School and clients say it’s a fun family neighborhood. It was built in the 90’s so some homes have been updated. House in Carpenter VillageGreat location for Raleigh and RTP with walkable school, amenities and good build quality in $450,000 up price range for single family homes. It’s a PUD so there are townhomes and condos too. I like the view from the gazebo on the lake with walking paths. Combines beautiful lots, community pool, best schools (built in 90’s)in the $400,000’s. Homes are relatively affordable and it’s located near Highway 55. The neighborhood has a pool, walking trails and a pond. Great schools. Lochmere is the only community on the list in East Cary. It’s huge! It was developed starting in the 80’s and into the 90’s and was an early Cary development. When Lochmere was planned there were 40,000 people living in Cary. Today there are 160,000 and growing. Lochmere is beautiful with mature trees, parkways and 3 pools. It’s close to Whole Foods, Waverly Place and Whole Foods. The downside for my clients is that some of the schools aren’t ranked as high as others. You can check out the test scores and compare on the NC report card website. There are so many great neighborhoods in Cary. If you have a favorite let me know and I’ll include it and the reason you like it. Thanks!